floating swanlike near the angle of incidence. the glass must be half the source's height. Unlike thought, which easily triples the whole. Although for generations of benighted English/literature students he is most well-known for his thesaurus, Peter Mark Roget was a multi-talented person of science who also invented the slide rule and who wrote an 1824 paper on the illusion of forward-moving wheel spokes seeming to spin backwards. It is this illusion of backwards forwardness that is both the title and major theme of Linda Bierds' 2014 National Book Award-longlisted poetry collection, Roget's Illusion. Divided into three parts, each prefaced with a "Roget's Illusion," the majority of the poems in Roget's Illusion are akin to that found in the excerpt from "On Reflection" quoted above. Breaking down the beginning half to "On Reflection," we encounter a narrator who is convinced that he is unable to position things just so in order to capture an image of the whole in a reflection. The mirror, apparently "too small" for the swan-like lamp casting light, is itself a reflection, as seen in the second stanza, where the lamp has apparently become the swan, and the reflection/mirror has to be half the source's height in order for it to work. But then there is another element, thought, that comes into play and which destroys and amplifies the reflection/illusion through its treple quality. If the mirror, as the narrator goes on to claim, is "bound by harmony," then what is thought but a transformative quality that reflects back perceptions and appearances, until it is lost in the impossibility of never quite being able to "contain the whole of it." This is a deceptively complex series of metaphors transpiring within the simplicity of a lamp, an image, and a source. Utilizing Roget's theorems on distance and light casting illusive images, Bierds here has made that disorienting sense of backwards forwardness palpable, eloquently presenting the artifice before the trick, catching us thinking of it all, only for us to complete the illusion in its totality in our minds. Yet despite seeing just how it all unfolds, despite it all being explained to us, there is still magic in the event. There is a similar quality to discussing Bierds' mechanics here, as she lays out her approach for the reader to discern, yet in considering the wires and framework, the reader still gets caught up in the thrill of the unfolding image, seeming spinning backwards as it moves forward in poetic space. in the midst of the late revolutions. Here is another natural object, a single fly wing, to serve as a point of comparison to another intruder, a strand of amber beard hair. As the narrator continues to write his political tract, he circles back to that singular wing and that solitary hair, seeing in their placement a sort of transcendence of order. It is this illusion of placement, of how chance is turned into an engine of order, that creates the illusory effect here. There is a slight echo of Frost's "The Road Not Taken" here, at least in the sense of how choice's tryanny comes to hold sway over us all and how we often wish it were not so, but Bierds' take centers more on the illusion of that control, as the political screeds embedded here serve as a reminder of how ethereal it all really is if we were but to provide a Johnsonian kick to this metaphorical rock. These two poems serve as exemplars of Bierds' concerns and her ability to manipulate image and rhetoric to create these illusions. The rest of the collection is largely on par with these two and it was a delight to consider each of them at length. 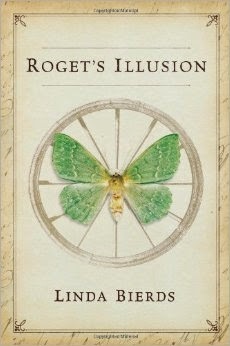 Roget's Illusion is a powerful collection, one that can surprise readers with its depth and artifice, and it certainly is well-deserving of its place on this year's Poetry longlist.